Garmin's Tactix line of smartwatches is the one you want when you're on a military-style operation, or if you're out and about training. It's the watch Jason Bourne would turn to if he were a real person. After launching the Tactix Bravo back in 2016, Garmin is back with its successor the Tactix Charlie. The big headline feature is the addition of pre-loaded full-color topographical maps that first appeared on the Fenix 5X. Built-in mapping and navigation will also help you keep on route wherever you go. while 16GB of storage means you should have enough room to download all the topographical maps you'll need. 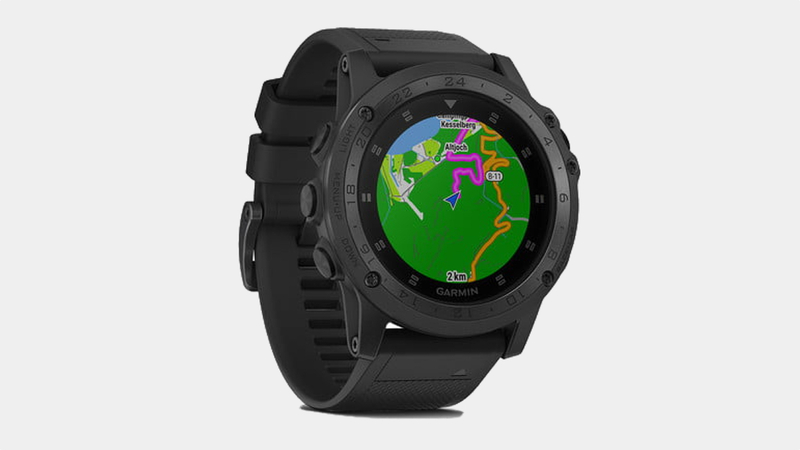 Like most top end Garmins, there's both GPS and GLONASS support for coverage in even the most challenging environments, which makes its diamond-like carbon coated titanium bezel, stainless steel buttons, and domed sapphire crystal display rugged necessities. You'll also have an altimeter, barometer and compass built in so you can track elevation data. A night vision mode for the 1.2-inch sunlight-readable display means you can look at your watch while wearing night vision goggles. There's also preloaded tactical features, which includes dual position GPS formatting and waypoints projection. It's also built for fitness packing a heart rate sensor along with Garmin's usual suite of multisport activities. That also means Training Status and Recovery modes are onboard to let you know if your workouts are paying off. If you want some smartwatch functionality that's there too. So you can receive emails, texts and alerts and access Garmin's Connect IQ store to download apps, custom fields and watch faces. In the battery life department you can expect 12 days in smartwatch mode and 20 hours in GPS mode. The Charlie is going to be available for your adventuring in the first quarter of 2018 and is priced at $750.